In the near future, drive-in theatres are turned into concentration camps for the undesirable and unemployed. Ozploitation films, you've just got to love them and this is by far one of my favourites. For those of you who are wondering what I'm on about, 'Ozploitation' is an Australian exploitation movie, a highly under-rated film genre that had a-lot of influence of upcoming film-makers of the time including Quentin Tarantino. Now I will be honest with you, when I first viewed this film I thought it was a bigger budget Troma release (I was wrong. It definitely has the same vibe, that is certainly no bad comparison and also gives you a sense of what the film is like. The cast do a well enough job of keeping your attention and entertained but honestly credit has to be given to writer Peter Carey for supplying us with a highly intriguing story that Director Brian Trenchard-Smith brought to our screens, and did a damn good job of it too. 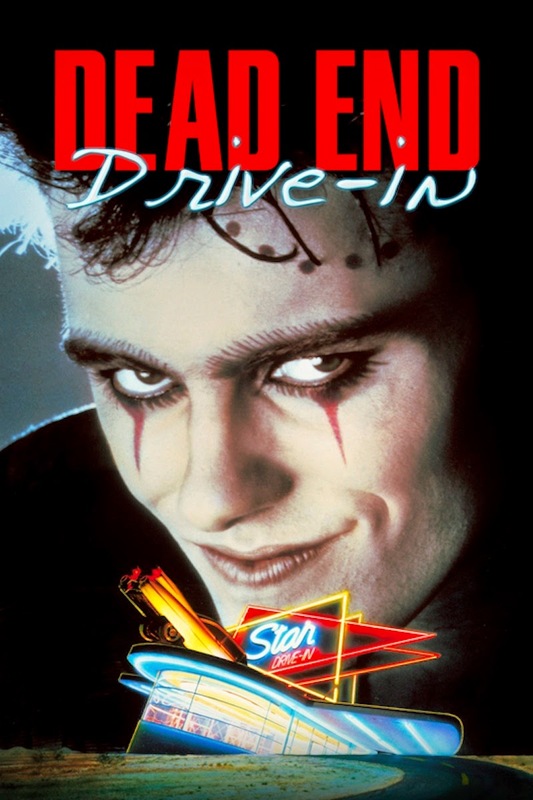 "Dead End Drive-In" is a must see film for anyone who's a fan of 80's films, apocalyptic films or even just for the action. I rank it very highly. Two of the films playing at the drive-in in the film are Dragon Flies (1975) and Escape 2000 (1982), also directed by Brian Trenchard-Smith. On the audio commentary for the Region 1 DVD, director Brian Trenchard-Smith states that U.S. distributor New World Pictures originally planned to follow the example set by American International and their release of Mad Max (1979) by issuing the movie with a new voice track featuring American performers re-voicing the Australian actors. However, the dubbing turned out so poorly, the company decided to release the film with the original performances intact. Apparently, to get the part in this picture, actor Ned Manning allegedly told director Brian Trenchard-Smith he was twenty-four years old, but in reality, at the time of casting, was thirty-six years of age. Director Brian Trenchard-Smith has described this film as "Part Mad Max (1979), part The Exterminating Angel (1962)". As a youth, in 1970 and with his father, director Brian Trenchard-Smith had gone to the very same drive-in which is seen in this film to see Sam Peckinpah's Major Dundee (1965). The make and model of the Chevy car seen in this movie was a red 1956 Chevrolet. This filmed adaptation of writer Peter Carey's short-story 'Crabs' was made and released about seven years after the short-story was first published in Carey's book 'The Fat Man in History' in 1979. The production shoot for this picture went for thirty-five days. These were split days, principal photography starting late afternoon at around 3pm and going to the early hours of the morning at around 5am. This was because most of the film is set at night. The drive-in location seen in this film had closed down when the movie was filmed in 1985. The drive-in has now been demolished and no longer exists. The name of the drive-in seen in this film was "The Star Drive-in". This movie's director Brian Trenchard-Smith included the exploding head scene from his earlier flick Escape 2000 (1982) during one of the shots of movies screening at the drive-in. The scene had caused that picture to garner an R-rating in the USA by the MPAA but this movie was not rated such. The name for the car culture kids who live at the drive-in was Carboys. Four hundred car wrecks were used as cars in the drive-in. They cost the production $100 (Australian) each. The movie poster seen early in the film was for the fictitious film "Rambo 8: Rambo takes Russia". The movie's hot soundtrack featured chart also-rans i.e. second to top of the pops level rock songs, the rights bought for about $8000 (Australian).